Four transformed bacteria populations are spread onto the plate in the picture. The media contains ceftazidime and histochemical substrate, X-gluc. All four populations grow on the media, showing that ADC-33 is successfully subcloned into the plasmids used to transform these bacteria. Bacteria containing gusA gene would show blue color. 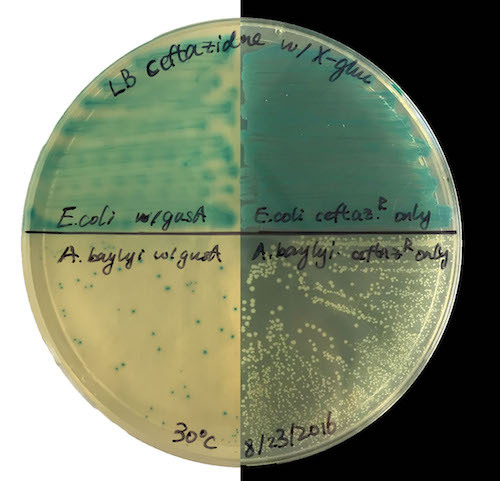 As gusA is an E. coli gene, two populations on the top panels both show blue color. The bottom left panel A. baybyi shows blue colors too, indicating that gusA has been successfully subcloned into the plasmid. The bottom right contains ADC-33 but not gusA, so they grow in white.